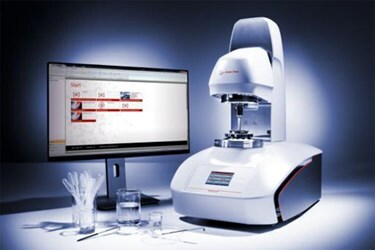 Anton Paar introduces two new members of the renowned MCR rheometer series: MCR 72 and MCR 92. Based on Anton Paar’s EC motor technology that has been continuously improved over the past 25 years, these two new rheometers are designed for quick, easy and accurate measurements with unmatched reproducibility. Anton Paar’s MCR rheometers have opened more doors and created more testing possibilities than any other rheometer in the world. In keeping with this tradition Anton Paar is now expanding the rheometer family with MCR 72 and MCR 92. With these new instruments a sample’s flow behavior, deformation and structure can be determined in a quick and easy way. Both models are streamlined for the daily lab routine, easy to use in a Plug and Play fashion and available at an accommodating price. The choice of rheometer depends on the application: MCR 72 is equipped with a ball-bearing motor which means it is very robust in use and no compressed air is required. It is designed to investigate the deformation and flow behavior of a sample. MCR 92 has an air-bearing motor for highly accurate for sensitive samples. This rheometer is recommended for observing a sample’s structure. Both rheometers enable measurements in both rotational and oscillatory mode and are available with a range of accessories to suit the application. As temperature has the biggest influence on rheological measurements there are different kinds of temperature devices on offer. Additionally there are several measuring systems available which suit different consistencies of sample. The automatic motor-driven elevation mechanism of the measuring head and the SafeGap feature ensure that the setting of the measuring gap is always identical for every measurement and 100 % reproducible every time. The literal highlight of these two rheometer models is clearly TruRay, the lighting of the measuring surface that can be gradually regulated for a clear view of the sample. When changing between measuring systems, QuickConnect allows one-hand connection of the measuring systems and ensures fast, convenient system changes without the use of a screwing mechanism. After this, ToolmasterTM takes over by automatically recognizing the mounted tool and temperature units.